Last version: 1.82, November 17th, 2018. Recently, I was asked if it is possible to remove stub items. The reason was they were going to transition to a newer version of Exchange and they wouldn’t be using the archiving solution in the new environment. When required, vendor tooling would be used to search through the existing archives. In such cases it makes sense to remove the stubs from the mailbox, which are shortcut messages that points to a copy of the original message in the archive solution. The new environment won’t contain the required Outlook plugins or extensions to retrieve the original message from the archive using the stub, making the stub lead to a partial or empty message. To identify stubs, one can filter on an attribute of each item, MessageClass. This attribute defines which kind of item it is (in fact, determines what form Outlook should use in order to present or process the information). Examples of MessageClass definitions are IPM.Note (regular e-mail messages), IPM.Note.EnterpriseVault.Shortcut (message archived by Enterprise Vault) or IPM.ixos-archive (message archived by Opentext/IXOS LiveLink E-Mail Archive). Now I wouldn’t have started this article if the same thing wasn’t possible with a little bit of scripting against Exchange Web Services and so the script Remove-MessagesClassItems.ps1 was born. Using this script requires Exchange 2007 or later and Exchange Web Services Managed API 2.0 (or later) which you can download here or you can copy the Microsoft.Exchange.WebServices.DLL locally and adjust the DLL path mentioned in the script when necessary. The script has been developed and tested against Exchange 2007, meaning it’s a PowerShell 1.0 script which should be compatible with later versions of PowerShell or Exchange. Also take notice that since you’ll be processing user mailboxes, you’ll need to have full mailbox access or impersonation permissions; the latter is preferred. For details on how to configure impersonation, I have written this article. Identity is the name or e-mail address of the mailbox. MessageClass specifies the Message Class to remove, for example IPM.Note.EnterpriseVault.Shortcut (EnterpriseVault). You can use wildcards around or at the end to include folders containing or starting with this string, e.g. ‘IPM.ixos*’ or ‘*EnterpriseVault*’. Matching is always case-insensitive. Server is the name of the Client Access Server to access for Exchange Web Services. When omitted, the script will attempt to use Autodiscover. DeleteMode specifies how to remove messages. Possible values are HardDelete (permanently deleted), SoftDelete (use dumpster, default) or MoveToDeletedItems (move to Deleted Items folder). Note that the Deleted Items folder will be processed, unless MoveToDeletedItems is used. Before can be used to only remove items received before specified date. MailboxOnly specifies you only want to process the primary mailbox of specified users. You als need to use this parameter when running against mailboxes on Exchange Server 2007. ArchiveOnly specifies you only want to process personal archives of specified users. IncludeFolders specifies one or more names of folder(s) to include, e.g. ‘Projects’. You can use wildcards around or at the end to include folders containing or starting with this string, e.g. ‘Projects*’ or ‘*Project*’. To match folders and subfolders, add a trailing \*, e.g. Projects\*. This will include folders named Projects and all subfolders. To match from the top of the structure, prepend using ‘\’. Matching is case-insensitive. ExcludeFolders specifies one or more folder(s) to exclude. Usage of wildcards and well-known folders identical to IncludeFolders. Note that ExcludeFolders criteria overrule IncludeFolders when matching folders. NoProgressBar prevents displaying a progress bar as folders and items are being processed. Report reports individual items detected as duplicate. Can be used together with WhatIf to perform pre-analysis. For IncludeFolders, ExcludeFolders and PriorityFolders, you can also use well-known folders using this format: #WellKnownFolderName#, e.g. #Inbox#. Supported are #Calendar#, #Contacts#, #Inbox#, #Notes#, #SentItems#, #Tasks#, #JunkEmail# and #DeletedItems#. The script uses the currently configured Well-Known Folder of the mailbox to be processed. Note: By default, Remove-MessageClassItems will only search IPF.Note class folders (i.e. containing mail items), so you’ll only see those being processed. If you want all folders scanned (also classless), use the ScanAllFolders switch. You’re feedback is welcomed through the comments; if you got scripting suggestions, please use the contact form. You can download the script from the Technet Gallery here. This entry was posted in Exchange and tagged Exchange, Migration, PowerShell, Script by Michel de Rooij. Bookmark the permalink. Michel, I would appreciate to learn more about the migration from EV to Exchange archiving. We are planning on moving from an Exchange 2007/EV 9.0.2 implementation to Exchange 2013 and the road block is the 34TB of data in EV and how best to get it back to exchange. On the plus side, we are not stubbing our emails. Nb : when you say 34TB is y compressed and duplicated DATA (singleinstanceless) ? Or just the DATA in disk ? Depends on scenario and setup. This customer cut off their archived data (ie isolated, available when required using vendor tools) and will move not (yet) archived mailbox data to the new e-mail environment, facilitating large mailboxes. Otherwise, they’d have to inject the original mail items using the stubs from the archive, but as that data is rarely consulted but has a significant storage footprint, they chose to cut it off. Fantastic script! This is extremely useful in removing third-party voice mail messages from the Exchange environment. Not being very adept at EWS scripitng(but learning); I’d like to know how would the script be modified to find messages of a specific class older than, let’s say, 45-days? The line with “[Microsoft.Exchange.WebServices.Data.ItemSchema]::ItemClass, $MessageClass)” defines the item filter. It’s a single condition; if you want to combine multiple conditions, you need to utilize a SearchFilterCollection where you add all the individual conditions. Then, pass that collection instead of the single condition to FindItems, e.g. New should be New-Object. Additional code was provided as guidance (so you get the idea on the approach), not as working example. I’ll have a look at it later on. Fantastic! Works perfectly! Thanks so much for your effort. I enjoy your blog and the UC Podcasts. Fantastic !! Can’t thank you enough. Is it possible to make age as one of the parameters and also parameter to include a specific folder. Thanks for your suggestions; was already working on update, which has just been published. Might consider Exclude/Include options for future releases. Can you give me some pointer as how to exclude messages in “Managed Folder” and its subfolders. We use Exchange Managed Folders for classifying important emails. Oops!! I meant exclude a specific folder. Thanks for the script. I am going to try to use it to see if my novice PS skills can change it from deleting items with a specified message class to changing them to a similiar but different message class. If you happen to catch this and have suggestions they would be appreciated. Thanks again for your contributions to date. I found a similar solution using the search-mailbox command. I chose this meathod because I’m not using Exchange Web Services. You can test with the following commands. This will search a mailbox, and all hits will be copied to another mailbox. You can look at that mailbox and see exactly what would be deleted if you used the -DeleteContent command. sorry to latch on so late, but i’ve tried doing the search way (because i thought it would be faster), but the content detected doesn’t seem to catch everything. I’d like to use search because it’s faster. Just tried this script today but unfortunately it’s not working for me. In verbose mode I can see it’s processing all the folders, but it didn’t find any e-mails with the class “IPM.Note.EnterpriseVault.Shortcut”. So, there aren’t any of those classes or the class specified is not matching. Can you elaborate a bit more on the situation? After reading the comment below, I know why it’s not working for me. The stub mail items are all in the archive mailbox. Because the script did show all folders including the ones in the archive mailbox I thought it was also working for the archive. I will use the search-mailbox cmdlet for now. If you include the option to process the archive it will be a great script. Keep up the good work! This is an awesome script. Thank you so much for taking the time to publish it. What if the stub is already in the user’s Personal Archive? Can we use the script to remove stubs that have already been moved to the user’s archive? Script currently only processes mailbox, but good suggestion,thank you. I’ll put it on the to do list. This is gold! Thanks so much. when I run the script I get the following. I’m running the script as a Exchange Administrator and I have full mailbox rights on this test account. I doesn’t remove any of the EAS messageClass items. Please check permissions or configure impersonation (see links in article for instructions) and try again. Yup the impersonation rights worked! I guess the full mailbox isn’t good enough! Great script. Thanks for it. I have a few suggestions that you can take or leave. – Include a parameter to run as a desired account to impersonate. + I did this as part of Troubleshooting my issues and it appeared to not be the root cause of the issue. Perhaps this is not required because of it. I’ve managed to get the script to run without error now (had various syntax issues), but it doesn’t seem to be doing anything. After hitting enter, I just get a line showing ‘>>’ and no further action happens. My bad, I didn’t edit the script, just the cmdlet. Your amendment now generates an error telling me it is not digitally signed? Appreciate your help. File C:\2010\Remove-MessageClassItems.ps1 cannot be loaded. The file C:\2010\Remove-MessageClassItems.ps1 is not digitally signed. The script will not execute on the system. Please see “get-help about_signing” for more details.. Thanks, getting there…. A whole host of errors now though. Appreciate your time but understand if you have better things to be doing! Property 'UseDefaultCredentials' cannot be found on this object; make sure it exists and is settable. Ah ok thanks, we are using 2010 but I will need to discuss with our main admin about the web services DLLs ec. @No need to install; you can install it elsewhere, copy the Microsoft.Exchange.WebServices.DLL in the same location as the script and change the location (in the script) accordingly. Updated version of script will have additional logic to look for that DLL by the way. Me again…. Now I’ve got this far… “Can’t access mailbox information store” ? Permissions; see instructions on usage (for links on) how to configure. Thanks again! By the way, is there anyway to delete (or edit) this thread? I fear leaving a full email address showing from the scripts wasn’t ideal. I have tried on a couple of users who’s mailboxes I have full access permissions on, however I am still getting an error stating it can’t access the mailbox information store. Do I have to use impersonation in 2010 or something? 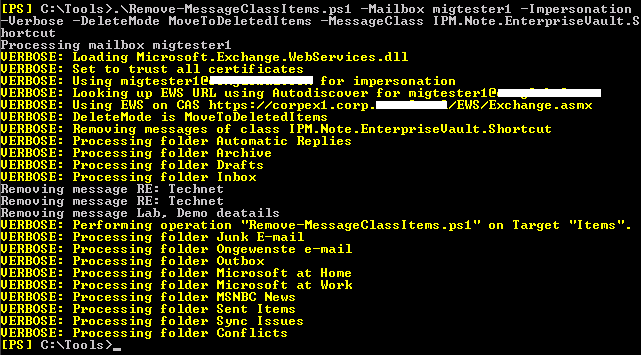 IPM.Note.Microsoft.Conversation files from the ConversationHistory folder on 139 mailboxes. I have my csv file ready but I was hoping to avoid running the script against all of the folders in each mailbox. No, not yet. I’ll put it on the request list. Thanks! One more thing – how can I export the results to a file? I need to run all my mailboxes with the whatif switch and analyse the results before I allow the actual deletions. Great script by thwe way. I wanted to know whether this script will work on a 2013 exchange evironment? i have followed the directions posted in reference to impersonation, but still running into errors whether i excute the script from a CAS or MBX server. I am trying to delete stubs from a legacy email archive solution. Have you waited for permissions to propagate? It can take up to 2 hrs due to caching etc. Quick follow up.. I notice for some of my users that the script is working for I have to run it a few times to catch all the EV stubs. Not sure if that means anything. against the failing mailboxes and now the script is working. Will this work against office 365. I have tried several times without luck. Getting the following error. No, not yet. o365 support is on the to-do list. I’m running the script and it seems to be working great, (both against on prem and cloud users), however on certain users it just stalls out on various folders. They don’t seem to be that large but they just can’t process past them. I’ve run it in verbose but i don’t see anything specific being reported. Performing operation “Remove-MessageClassItems.ps1” on Target “Remove 431 items from Inbox”. (don’t have Ex2007 at hand, should this be a PoSH 1 quirk, you can run it from system running a more recent version of PoSH – it will run against your mailbox on Ex2007SP1+). I ended up finding out it was an issue with impersonation. When I use impersonation it works fine. I also ran it from a 2012 server running Powershell 3 and the Exchange 2013 tools on it. One additional thing, when it goes to delete the items, it always prompts you to confirm. This is a good thing by and large. But it seems for whatever reason when it calculates the number of items in the inbox, it is more than double what the actual stubbed email count is. Every other folder it seems to be 100% accurate. Can you think of a reason for this, or perhaps it might be a quirk? Michael, I found another thing I cannot explain. When running the script, it appears to not parse certain mail folders inside certain users mailboxes at all. Nothing special about these folders. I thought it might be a permissions thing, but looking at folder permissions, it seems that there would be nothing inhibiting it. Plus I thought with Impersonation, folder permission should be irrelavent. I could look at something in MFCMapi or PFDavAdmin if you want, but I am not sure what to look for. I did verify the messageclass is identical across all instances, (IPM.Note.MimosaStubMimosa1), so it’s not like some stubs have different message class than others. Every test user I have run this against has similar results. It’s just not hitting all folders. Michael, I think I may have found my problem, let me know if you think. When looking at the script run, I found this text when running in verbose mode: “VERBOSE: Scanning all IPF.Note (E-mail) folders”. This led me to go into MFCMapi and look at the folders not being parsed. It appears none of these folders have the “PR_CONTAINER_CLASS” of IPF.Note. In fact, the folders do not have even have the “PR_CONTAINER_CLASS” field at all. Not just not poplulated, they do not have that attribute at all. For your information, about 80% of my users were migrated to Exchange from Groupwise many years ago, and it’s possible that when these folders were created in Exchange at that time by the (Quest) Migration tool, it created the folders as some odd type? Just throwing this out there. You may or may not have a way to fix this… thanks again. The ScanAllFolders switch should allow the script to find (and remove) items in all folders (default is IPF.Note only). I’m not sure if Exchange would return “class-less folders”. Thank you very much Michel, the -scanallfolders switch did absolutely work! this is great! All roads lead to Rome. Yet, that requires Ex2010 or up, EMS or being member of the Discovery Management role group to name a few. There are lots of pre-Ex2010 customers that want to get rid of the stubs before moving data over (On-Prem or ExO). The script is not meant to be a replacement for Search-Mailbox (as indicated in another comment). The search-mailbox command does not exist in Exchange 2007. Just a heads up that there are thousands of customers out there still using Exchange older than 2010. Sometimes Microsoft forgets that. We cant all be bleeding edge. I do have a problem however that no emails are found. When I run it with the other powershell, it does find results. I’ve managed to get your script working after configuring impersonation. I can’t get it running without it. The account I’m using is in another domain than the user mailboxes, so that might be the reason? I am not aware of any resource-forest limitations. What is the issue? What it does do though, is if a read reciept had been archived and it removed the reciept stub, Exchange sends an email to sender of message stating that the item was deleted and not read. Is there anyway to prevent this happening ? This will no doubt generate quite a few bits of confusion on mass mailbox enviroments. Thanks for the suggestion. That has already been put on the list to be implemented in a next version. We resolved this by creating a transport rule which caught read-receipts from sender (mailboxes being processed ) this caught them whilst script ran. Really helpful script, I am looking for option to get only the shortcut count not to delete them. I couldn’t get this working, if possible can you add in the script and post here please. Any other options for processing against multiple mailboxes? I’ve tried the imiport-csv option but I get an error that The term ‘Remove-MessageClassItems.ps1’ is not recognized as the name of a cmdlet. I would like to be able to run this on a per database level. Check the other comments, attention areas are permissions, firewalls etc. My comment on the get-mailboxdataBase | removemessageclass was a request. It would be nice to run this on a database level. Hi Michel, We have 1200 mailboxes which need the archive stub removed, and the script runs fine, but fails on 10%, for whatever reason, is there a way to ID why and which mailboxes failed. I’m using exchange 2007 and moving to 2010. As already answered through e-mail, check your Autodiscover configuration, DNS entries, firewall settings etc. Are you using Hybrid configuration? Yes this is a Hybrid configuration. As a matter of fact, i have also tried a pure Office 365 tenant, from different location and got excat same error. I have used the -server switch with Outlook.Office365.com and got “can’t access mailbox information store” error. Thanks for the script. It ran successfully however as it ran, I received couple undelivered messages which I did not send and also don’t have on my sent items. I tested with another user got the same issue. Any idea, could it be read receipt of unread emails? It’s the processing of read receipts or calendar invites. It’s on the list of enhancements. Can you provide me a resource as to make this script work. I have no knowledge of scripting with EWS. I have installed the API but all attempts to make it work have failed. I think I have it now. Didn’t see the download for the script. Script runs but doesn’t delete anything. I have tried exact message class name and partialmatching switch with general class name and neither will delete the items from my deleted items. Account has (full access) permissions or impersonate permissions, and permissions on the folder containing duplicate items (per folder)? Yes. Running on CAS with domain admin rights. Don’t understand your permissions on the folder containing duplicate items question. Folder permissions from Outlook are Default and Anon. – None. Shouldn’t I get an error if I don’t have rights? I will read more into the impersonation. Thanks for the script. it is working fantastically for most of our mailboxes and folders within it. we are triggering the script from Exchange 2010 and we have exchange 2010 as well as exchange 2013 in our environment. We have processed most of the mailboxes and folders within it but suddenly for one of the folder of anyone mailbox we faced following error as shown below. we tried accessing this folder and we could access it. the common thing is that we are facing issue only with mailboxes located in exchange 2013. we have verified personification permission and are good on that side for user credentials being used. also, it is working for all folders except few from exchange 2013. request you to kindly look into it. A ‘timeout’ parameter is on the wishlist. Thanks for the suggestions. However, we are facing another issue with the same script. for some folders it prompts the previous error and for some the one that is displayed below. I verified on permission side and also tried accessing those folders by logging to users profile by admin account, it is accessible in that way. Any kind of help or suggestions would be helpful. also, any link or blog with in depth information about EWS operations and flow and specifically in regards to this script would be of a great help to us. just to add that it processed most of the folders very well in this mailbox. However, failed for a specific folder which is different than the todays folder. Yes, permissions are very much in order and so it is working fine with other users and folder on the same server. However, if you want me to verify some permissions please let me know so that I could verify and get back with result. At the beginning of the script I saw another error message, don’t know if it has anything to do with the error. I have given that error below which is related to EWSManagedAPI. After making changes in EWS time out as suggested by you, here is the next error. Any help or any pointer would really be of great help ! Thanks a ton for your solution. I believe the first solution for Time Out value worked for me, I am able to complete the reports fluently. it gave above errors and I just increased the Time out value and it started working. I am further looking for a script which could help me to remove older data which is older than specific date in a Mailbox.. it would be great if you could guide me to any script which could help me in this case. Also, tough the reports are successful. I am getting this error at the beginning of all users information. do we have any workaround to overcome it ? Older data .. why not apply a retention policy clearing out item older than X days, or is it a one-time task only? Yes, it is the one time task and need to do on multiple users at a time. so just for one time activity we can’t go ahead and have retention tags and policies for multiple users. Also, I pasted the error that I am getting in current script. Thanks for looking into it. Yes, check the other comments. It’s on the shortlist of enhancements. Great, thank you for the prompt response. I also tried -ScanAllFolders with no luck. Am I missing something as to why it wont scan this particular folder? I read through entire blog and comments and didn’t see anything jump out. Thanks for any guidance you can provide!!! we are doing the same migration but i can’t delete anything for now… i need to create a search folder in everyone’s outlook with all the message Class IPM.NOTE.EnterpriseVault.Shortcut in it so the user can clean their own vault. I only had to change $_.Identity for $_.Alias to make it work, as the Identity value has spaces, and Alias does not. Running your script to all mailboxes of a specific database, asks for deletion confirmation for every mailbox it encounters. Is there any way to automate this response (for example A to delete all ítems, etc.) to avoid typing this for every mailbox? Awesome script. It’s weird that MS decided not to allow this in the “advanced” search applets of Exchange 2013. It is possible to move the items to the deleted items folder, but what I want to do is to export the items to a PST file and remove them. If it was possible to move the items to a random new empty folder, that would be great. If this folder could be located in a different mailbox, that would be even better. Is this something that would be hard to add on? Exporting to PST yes, as I’m interacting with the mailbox through EWS and have no ‘PST library’ at my disposal. I could create a ‘Duplicates’ folder and dump everything in there; noted on the wish list. Thank you for putting it on the wish list. As a work-around, could you not clear out the deleted items folder temporarily, and allow for a “Move to Deleted Items” execution? This would isolate your results into the Deleted Items Folder. This is not an option, users often have good reasons for keeping messages in their Deleted Items Folder (I only have one, but hey …). Also using the Deleted items folder for live data, or actually anything else but junk, makes my techy-sences tingle inappropriately. Yeah, my point was to use this as a potential temporary one-off process for one (or a small number of users) who may have a large number of items of a particular message class which were looking to export to PST. That workflow would involve (per user) temporarily moving all items out of Deleted Items (into a subfolder), and using the script to “delete” the particular message class items into the Deleted items. Since the Deleted items would then contain nothing but the items with that particular message class, you could then export it to PST. Once complete, you’d then place the original deleted items back into the Deleted Items folder, and leave the user alone. Yeah, it’s A LOT of mailboxes in this case. And doing it by hand, it would probably be easier running a search on messageclass in outlook and then dragging the results to a temp mailbox, folder or PST. Thaks though… workrounds are welcome too. All it needed was a check on ItemClaas before moving and a search iteration per folder to improve efficiency. It recreates teh folder structure at the target and it automatically skips the target folder when it a subfolder of the source folder, so you can just create target folder and move everything from “\” (=root) to it and it will all be just fine. Am I missing something easy? The account used to run this command has got the Full Access and Impersonation rights on the mailbox. Any help with this will be appreciated a lot. What’s that ‘mailto…’ doing in there? Also, please relog before trying again. I do not have mailto in the command which I am running, it’s just when you hover your mouse you get to see that, which is expected, I think. The same command worked on one of my colleague’s machine. I have installed the same version of EWS Managed API, still no go. Will try few more things and keep you updated. Ah, I replied to the notification mail which showed the mailto HTML tag as plain text. Odd. Anyway, cmd looks ok – can’t access information store is usually something with access (permissions). You did specify Credentials, providing credentials with sufficient access? It appears this methodology deletes the emails of said message class before export… is there a method you could describe to export a pst that simply had a specific message class excluded or export a pst that is only of a specific message class (ipm.note e.g.)? Hi Michiel, by ‘modern’ are you referring to Exch2016? Search-Mailbox in Exch2013 does not support the “Message Class” property keyword. Right? Am I missing something? My bad – you can use -MessageType but that is limited to predefined types (eg Email). Specifying -SearchQuery ‘IPM.NOTE.EnterpriseVault.Shortcut’ works though, but might match on too much items (not bound to message type). Unfortunately (for us), we are still on Exchange 2013 (and will be for a while). Can you (or anyone) recommend a 3rd party tool that can accomplish this? You need to use ews to move items to a separate folder and then export the mailbox while either selecting or excluding the particular folder you moved the items to. I’m trying to run this against our Office 365 environment to try and clean out EnterpriseVault stubs and am getting all kinds of errors, I’m guessing because it’s running Exchange 2016? The property ‘Url’ cannot be found on this object. Verify that the property exists and can be set. Looks more like something with the EWS Managed API you’re using – which version you have installed? I have this same issue with EWS Managed API 1.2 and 2.2. Running Exchange 2013. You are running this from a PowerShell session, not the Exchange Management Shell? Great script and solved a lot of manual work. However as a programmer i would recommend to use and handle try catch blocks whenever possible and accordingly. It’s a hassle to figure which line of code caused an error while each time an error message called “Can’t access mailbox information store” appears! As a programmer, I would say the error is already thrown in a catch block, but nested ones don’t go well indeed. Only thing is I could add $Error to the output, however it’s usually the same one (access denied). Cheers! Which version are you running? 1.52 addresses an issue throwing such error. Also note that for Office 365 (use e-mail addresses as Identity) you need to specify/use Credential; for on-prem, your current credential will be used. computer. Do you want to run C:\Windows\system32\Remove-MessageClassItems.ps1? C:\Windows\system32\Remove-MessageClassItems.ps1 : The input object cannot be bound to any parameters for the command either because the command does not take pipeline input or the input and its properties do not match any of the parameters that take pipeline input. thank you for the great script! It is really useful. I would like to ask a question since my scripting skills are not up to par to make necessary adjustments. So my case is as follows: I need to delete EV shortcuts older than 90 days in all the folders excluding one folder AND its subfolders. I started with running the script with -ExcludeFolder specifying needed folder as its parameter. Script runs and excludes the folder that I specified, but still wants to process its subfolders and delete EV shortcuts from them. I see there is a line of code $FolderView.Traversal= [Microsoft.Exchange.WebServices.Data.FolderTraversal]::Deep that may have something to do with this behavior. However, from what I read and understood the logic of he Folder Traversal, this part should ensure that subfolders of the -ExcludeFolder will be excluded by the script too, which is not happening. Can you please help to figure this out? Currently the folder(s) specified only apply to that folder, not subfolders. Logic is coming to make this a lot more flexible (already implemented for the duplicate removal script). It’s more than traversal setting, which determines if search is depth first or breadth first. Stay tuned! Thanks for the reply! By the way, the duplicate removal script is also awesome and much better than mentioned paid solutions. Great script – does almost precisely what I need. But I’ve got a nervy client who would like to move the stubs into a new folder so they can be examined prior to deletion. I thought of using the MoveToDeletedItems, but then the stubs would be lumped in with the normal cruft. If there any way to have an option to move all of the items found into a new folder – no need to recreate the folder structure? The last version adds -Report, which you can use together with -WhatIf:$true to get a matching items found per folder. This may help in their analysis. Thanks for the response. I’ll give that a go. Sounds like just the trick. You could also temporarily clean out the Deleted Items folder (prior to execution), or simply sort by message class in Outlook (after using MoveToDeletedItems) and then move to a new folder at that point. There were 112,000 items in there, so that might have been the limiting factor. Could you hit me up on e-mail (contact form); I have an update which should prevent this for you to try. Michel, I meant to reply to this months ago – but the time passed me by. Thanks for the prompt response to this, I managed to run this against each of the mailboxes which had been migrated and all looks good now. Wouldn’t have managed it so easily without your script. First off, i love your blog and i am glad you are keeping up with it! WOuld it be possible to adjust your script so that it convert the message class from “IPM.NOTE.EnterpriseVault.Shortcut” to “IPM.NOTE” ? Hi, WHen I add -replaceClass to replace pendingArchive, I receive error for the command. Great blog, and thank you for your work on this script!! “3” argument(s): “Value cannot be null. Many thanks again. I am unsure what ‘Exchange Server doesn’t support the requested version’ may refer to. OK I’ve resolved the Exchange version error. VERBOSE: Loading module from path ‘D:\Temp\Jeremy\Message Class scripts\Microsoft.Exchange.WebServices.dll’. Hi, I think you should run it on the on exchange power shell 2013 or above. Opposite, should be run from basic PowerShell session. Please use EWS Managed API 2.2 (you have v15.00.0913.015 installed which is 2.0 IIRC), v2.2 supports additional EWS calls which are required. My bad, v15.0.913.15 is the 2.2 one ; did you run it from a regular PowerShell session? Yes, from both PS ISE and a regular PS prompt, too, both as Adminstrator, as well as just opening the shell without admin. When i run the syntax with switch -replaceClass. I got this message. if without running the -replaclass, i got it work. Are you running against Exchange 2007? If so, you need to specify the MailboxOnly switch (or else it will try Ex2010 mode, which Ex2007 doesn’t support). Just need to find out, if i use this command below does it delete the pendingArchive too? EV will set the class of those pending items to IPM.Note.EnterpriseVault.PendingArchive. So, no IPM.Note.EnterpriseVault.Shortcut will only process items which EV processed (i.e. archived). Thank you Michel for clarify this! you did a great script!!! VERBOSE: Loading C:\Program Files\Microsoft\Exchange\Web Services\2.2\Microsoft. Thanks a lot for the script and actively supporting it. Can we use the script to remove messages from Recoverable Items of both primary mailbox and online archive? We have few users with 100 GBs of data already accumulated withing Recoverable Items due to a bug in the 3rd party Outlook plugin. There is a retention policy (aka hold in place). In the current version no, but adding Recoverable Items to the process is fairly easy. Standby 🙂 Do note you need to remove the hold prior to cleaning up Recoverable Items, or it won’t help. Also note that removing the Hold may impact compliance due to the system removing items beyond retention. I am aware of the pre-reqs to delete message for mailboxes on-hold. I think we will need to temporary disable the retention policy for a user, then run your magic script and hope that managed folder assistant won’t kick-in before we re-enable the retention. The problem is that there are literally 100GB of duplicates, so it will take ages to clean up (we are on Office 365 and likely will be throttled by EOL). Looking forward to try the script in action. First of all, great post and script, save us a lot of time to do the manual activity! to IsMoreThan but not work. Can you please share some tips which line i can start with? “FindFolders” mit 3 Argument(en): “Der Wert darf nicht NULL sein. No idea- using FA or impersonation? No, haven’t seen that one before. To see what’s going on I need to be able to reproduce the situation. In what way are you calling the script, and what version of the EWS Managed API (DLL) are you using?